Proposal: Change of use of the Shoot Lodge at Iford to a mixed use as a facilities building for game shooting for no more than two days a week from 1 September to 2 February in each year and for use as a Forest School and conference/training room, and associated parking. There are no physical changes as to the building or parking area. The wording of the application is very vague on the exact area in which the forest school will operate. Clearly the SSSI (Site of Special Scientific Interest) would need a Sussex ranger to oversee possible damage to the rare plants, insects and animals. The application says they would not use it ‘for the most part’ but that, in effect, means that they will sometimes use it. The ‘long abandoned chalk pit’ will almost certainly have safety issues and both this and The Spinney are where, I believe, the pheasants roam which are bred on the nearby farm. I am very concerned with children playing in areas inhabited by pheasants. I would want assurances from an independent health organisation stating that there would be no chance of the common tick infecting the children. The application says that parking would be limited to 5 spaces. This comment alone sounds a warning bell with me. Five spaces to be shared between organisers and parents seems rather limiting. The application information provides no information as to who will be operating the Forest School. 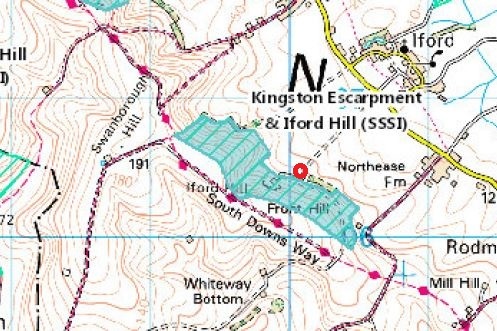 The two Forest schools I know of, one at the railway land Lewes and the other one in Friston Forest both have strong associations with the Sussex Wildlife Trust.